Davis, D. R. 1986. A new family of monotrysian moths from austral South America (Lepidoptera: Palaephatidae), with a phylogenetic review of the Monotrysia. Smithsonian Contributions to Zoology 434:1-202. Davis D. R. 1999. The Monotrysian Heteroneura. Pages 65–90 in: Lepidoptera: Moths and Butterflies. 1. Evolution, Systematics, and Biogeography. Handbook of Zoology Vol. IV, Part 35. N. P. Kristensen, ed. De Gruyter, Berlin and New York. Friedlander, T. P., J. C. Regier, C. Mitter, D. L. Wagner, and Q. Q. Fang. 2000. Evolution of heteroneuran Lepidoptera (Insecta) and the utility of dopa decarboxylase for Cretaceous-aged phylogenetics. Zoological Journal of the Linnean Society 130:213-234. Nielsen E. S. and D. R. Davis. 1985. 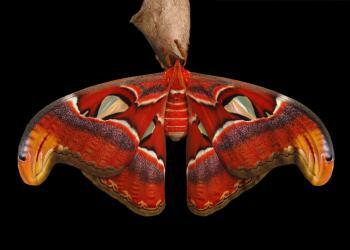 The first southern hemisphere prodoxid and the phylogeny of the Incurvarioidea (Lepidoptera). Systematic Entomology suppl. 1:1–16. Simonsen, T. J. 2001. 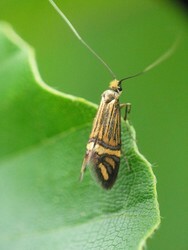 The wing vestiture of the non-ditrysian Lepidoptera (Insecta). Comparative morphology and phylogenetic implications. Acta Zoologica 82(4):275-298. 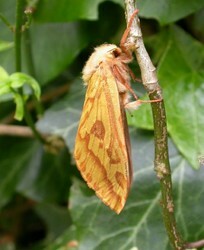 Newly emerged specimen of the world's largest moth. Page: Tree of Life Neolepidoptera. The TEXT of this page is licensed under the Creative Commons Attribution-NonCommercial License - Version 3.0. Note that images and other media featured on this page are each governed by their own license, and they may or may not be available for reuse. Click on an image or a media link to access the media data window, which provides the relevant licensing information. For the general terms and conditions of ToL material reuse and redistribution, please see the Tree of Life Copyright Policies.